Human-Machine Interaction (HMI), is a main annual research conference aimed at presenting current research being carried out. The idea of the conference is for the scientists, scholars, engineers and students from the Universities all around the world and the industry to present ongoing research activities, and hence to foster research relations between the Universities and the industry. 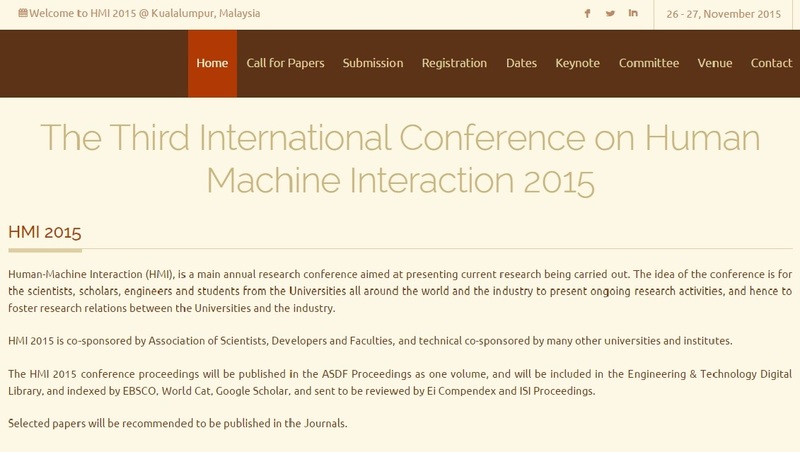 HMI 2015 is co-sponsored by Association of Scientists, Developers and Faculties, and technical co-sponsored by many other universities and institutes. The HMI 2015 conference proceedings will be published in the ASDF Proceedings as one volume, and will be included in the Engineering & Technology Digital Library, and indexed by EBSCO, World Cat, Google Scholar, and sent to be reviewed by Ei Compendex and ISI Proceedings. Selected papers will be recommended to be published in the Journals.